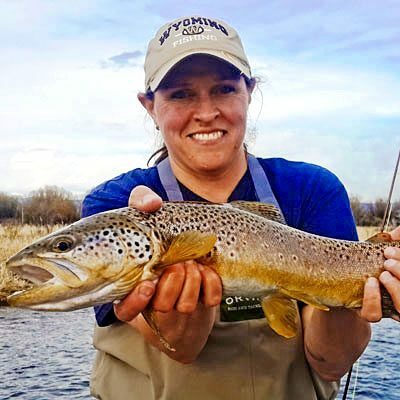 Having grown up in the mountains of the Pacific Northwest (Idaho, Alaska, and Oregon), combined with a career in biology of over 20 years, Katie has had the opportunity to spend her entire life exploring the outdoors and fishing many incredible streams. Katie recalls fond childhood memories of hopping from one fishing hole to the next in search of feisty brookies and rainbows, with her only parental instruction being that she had to be back in time for dinner. Katie eventually moved to the Pinedale area with her husband, Bryan, in 2006 and has been enjoying hunting and fishing in the local mountain ranges and waters ever since. When not hunting or fishing, Katie manages a local ski and summer resort in Pinedale. Katie shares her enthusiasm for the outdoors with her husband and daughter; fishing the area year-round.